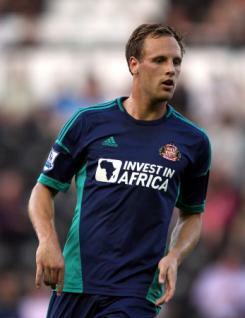 David Meyler is a young centre midfield player who signed for Sunderland from Cork City in July 2008. David quickly established himself at reserve-team level and was drafted into the first-team squad by Steve Bruce to cover for injuries, making his debut against Blackburn in December 2009. He went on to gain more senior experience in 2009-10, but suffered a serious knee injury during the 1-0 defeat at Manchester United in April 2010 and this led to a lengthy lay off. David eventually returned to action for the first team in December 2010, although he suffered a further injury the following month. He featured on the bench towards the end of the season, but had not fully recovered by the start of the 2011-12 campaign. A determined, gritty player with great stamina, he has represented the Republic of Ireland at U21 level.